We all are aware of how the website has been developed in the past, right? Developers used to write all the HTML and CSS codes manually, which was very tough and time-consuming. But thanks to the modern and rapidly developing technology – Content Management System that has made easy for all to have a website in a short period of time. In this article, I will explain Content Management Systems in detail for the newbies. Most of the people have a perception that WordPress is a blogging platform. Here, we can take help of kernel of truth for better understanding. WordPress is the continuation of the b2 platform that was designed with an aim to start blogging. Further, if you are a desired WordPress user then you’ll understand that the platform has developed into full-fledged Content Management System – CMS. The name itself tells you that a CMS helps to create, store, modify and publish the digital content. The main advantage of CMS is that it allows various people to work on a similar project. All members can share, edit and collaborate on the same files of the library. It is important to know that there are multiple types of CMSs. Though their objective and functionality is the same but the purpose is different. 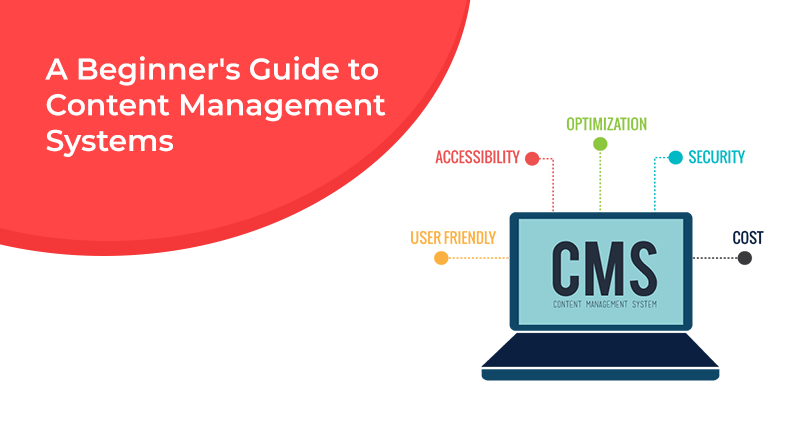 As we have discussed above that this guide is based on Web Content Management Systems (WCMS) that are mainly used to design and maintain the websites. How to Use CMS for Creating a Website? At a first glimpse, you may find it a little bit technical but the main benefit of using CMS is that it’s easy to use. You only need to learn coding or need experience in developing the website to use CMS platforms. To understand in a simple way, we can take the example of building a house. You can relate the CMS to the essentials that are walls, roof, doors and plumbing. Its main objective is to place the foundation and allows you to focus on furnishing, decorating the interior, etc. In technical terms, it is about making your website popular with content, changing its appearance and making it easy to access. With the CMS, you’ll get basic functions for building a website. Moreover, you can further develop your website by including new functions for creating a dynamic and unique website. For a security point of view, it’s important to allocate the user roles to safeguard and allow access to everyone for content and other necessary functions. The internet is huge and it’s not restricted to a single language. Likewise, this is also applicable on your website too. Many CMS platforms are available in various languages and they’re easily translatable. Your blog will grow over a period of time and you will need to expand it further for better performance. However, opting for a CMS means building a scalable website and expanding it as per your demand. The Application Programming Interface (API) makes it easy to access to everyone. There are many other options available to create a website instead of just the CMS. For instance, you can also start designing a website from scratch. Further, you can take the help of a website builder for building the website. You will get a question then why CMS is important if other options are available? So, let’s take a look at the next point for a better understanding. Most of the CMSs are free to use. They offer an experience that balances experts and newbies equally. It allows customizing the experience of managing the website than any other system that requires taking the training of team members. They offer full access over nearly every aspect of the website. Just make sure that you’re getting required functions in the CMS which you’re selecting for your website. They provide instant website maintenance feature. They consist of plenty of options for themes and plugins. Yes, I know that WordPress name itself is enough when it comes to the development of the website. As per the study, nearly 60% of websites are built using WordPress. It doesn’t require any experience to develop a website. In addition, it offers millions of plugins and themes that allow altering of the website. In terms of security, WordPress offers ‘n’ numbers of plugins that can be used to protect the website. If you’re concerned about SEO then don’t worry because it’s by default SEO friendly. If you check our plans then you’ll get the feature like 1 – click installer that helps you to install any CMS as per your wish for development purpose. Yet another popular CMS or content management system is Joomla. Joomla is also an open source and free CMS that allows users to create a website. Without paying anything, you can develop your website or blog using Joomla CMS. Like other CMS, Joomla also offers themes and plugins for free and paid. It is suitable for building a wide range of unique websites. If you want to develop a static website including blog features, polls, news feeds and search functions then for managing and implementing, Joomla is the best option. Magento is perfect and best CMS for the online store. No doubt, you must be considering WooCommerce but Magento is also the most utilized platform for developing an online store. Magento is developed from the ground up to real eCommerce framework. In short, it’s easy to set up a store, manage products and smoothly navigate. To enhance the store further, Magento offers plenty of extensions. Yes, if you’re not aiming to start an eCommerce store then Magento is not for you buddy. You can opt for other CMS options. Last but not least, one of the most popular CMSs is Drupal. Drupal is also used by many large websites like White house and Economist. It offers features like audio and video content, text editor, E – forms, full-text search and website management. If you’re are developing medium or complex web project then Drupal is the best choice to start the journey. It is an open source CMS that has a large community which is committed for years to a project that is featured by its flexibility and security. Moreover, it’s a free CMS that is written in PHP and it’s script involves the capacity to design elements editing feature. For developing a website selecting a CMS is a smart choice instead of adopting a lengthy process of coding and HTML. You can immediately start displaying your work to the world with the help of CMS – Content Management System. A passionate Digital Marketing Ex and Content Writer working with MilesWeb. I am passionate about writing blogs related to Information Technology and Digital Marketing. In my free time, I love to watch news channels and hang around social networking sites.